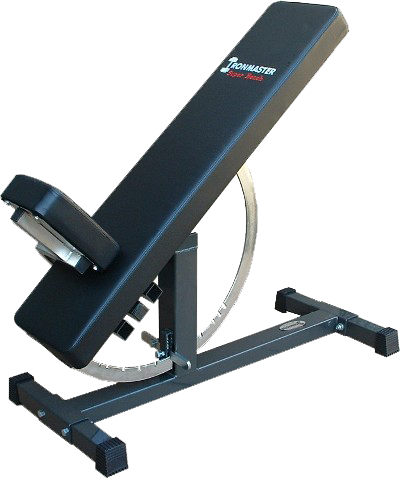 Super Strong, Super Versatile, Flat, Incline, Decline, Upright, 11 Angle Bench! 11 lock out angles: Inclines, Declines, Flat and Upright. 0, 5,10, 20, 30, 40, 50, 60, 70, 80 and 85 degrees. Unique adjustment ring with foot lever adjust operates from both sides and locks up tight! Patented design US 6,994,661. Powder coated frame with chrome components. 44″ long x 18.75″ wide x 20″ high overall dimensions (18.75″ x 41″ frame footprint). 44” x 10” x 3” thick commercial grade pad and stitched vinyl upholstery. Very comfortable. New style pads have 1″ radius corners. The 3 position incline seat is narrower than the backrest pad so it does not cut into the inside of your legs and you can move the seat up or down for optimum comfort. Seat height from the floor in the upright position is 16″, 14″ or 12″. Backrest pad is 31″ above the seat in the highest position. Incline seat follows backrest pad at any angle so it will always be perpendicular unlike other benches where the seat can have a shallow angle allowing the user to slide off. Accepts a growing list of optional attachments like the Crunch Situp, Dip Bar Handles and Chin Up Bar. Ships pre-assembled except for feet so you can start lifting in just a few minutes. Stay tuned for future attachments being developed!